After the successful debut and fine weather of the Drifta Fan Camping Event (DFCE) 2017, we were quick to order our tickets for #DFCE2018. This time, scheduled for the beautiful Camp Cobark in May. The promise of fighting off the Barrington chill with a squadron of fire pits was as alluring as last time. 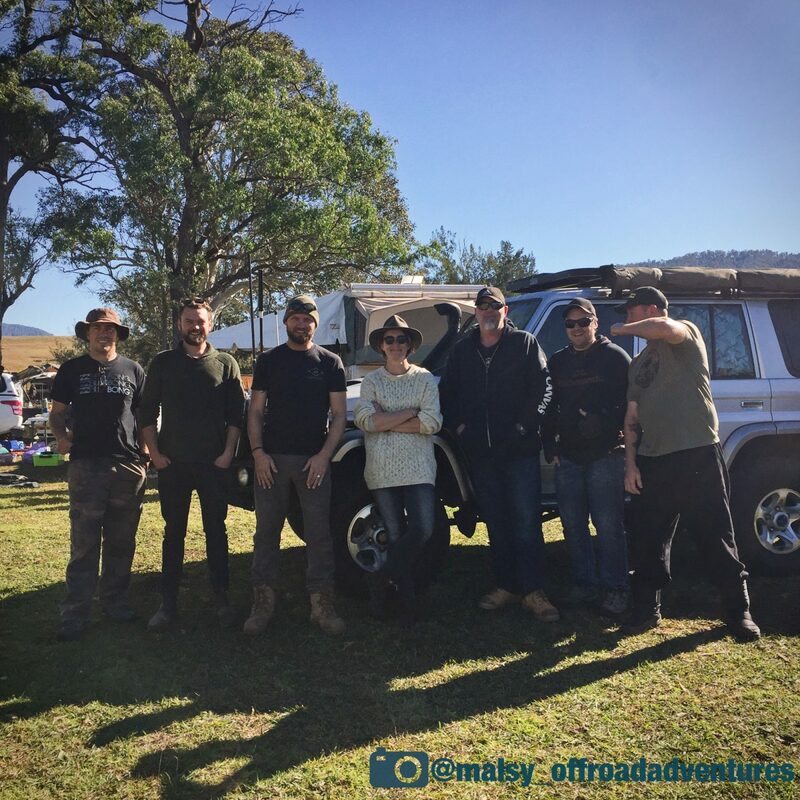 The long wait until May was only made to feel longer with coordinator James Mandy announcing not only Western Australian adventurer Ronny Dahl and the team from 4Wheeling in WA would be attending, but also, that Harry from Fire to Fork and the Collisters from Adventure Curated would be in attendance. Demonstrating mouth-watering fire cooking and coffee brewing respectively. There would also be a live band, Bowden Brothers, and meat smoking aficionados- Pitt Brothers. Just how much can you squeeze into a weekend of camping? Just like the TV says; but wait there is more. Self-guided 4WD circuits would be provided for those wanting to explore those yonder mountains. We made good time and arrived late morning, Oztent palace unfolded in no time, we helped out with some of the setting up. Toilet paper deployed to the hired water closets and a truck unloaded, we headed into Gloucester to stock up our empty National Luna fridge. After lunch at Café 57 we visited the butcher for some flesh we could char later. IGA for snacks and sparkling mineral water and we were revving the newly remapped VDJ76r up the winding road again, back to Cobark. Purchasing some wood from the supply heap, I set to making the bed whilst David split some timber for the fire pit. What transpired next beggars belief, so much, that David insisted I was joking and kept on splitting. I had forgotten our self-inflating Thermarest airbeds. In fact I recall kicking them out of my way when searching for my Manfrotto tripod. Do we camp often? Anyone who has seen the LandCruiser, and those who had a good look that weekend would attest – surely we did. My excuse is weak but, blaming the swag – of which we have taken on the last couple of trips, does not require them, it has its bedding conveniently rolled within, organisation need not apply. And so, I am blaming ‘swag inflicted senility’. At the later hour of the day, I perused the options. Six year old foam mats used for showering and wet weather live in the LandCruiser, but only four of them, and they would provide thin comfort against the cold ground. Dashing into Gloucester, the hardware shop was still open, just. He provided an inflating air bed and pump. Last time I slept on one of these, I was a kid. Back at camp, the light fading, it took a while to orientate myself around the little 12v pump. But in a couple of minutes, the sheets and blanket applied, bed was made. Still kicking myself for forgetting my warm inflated Thermarest air mattresses. 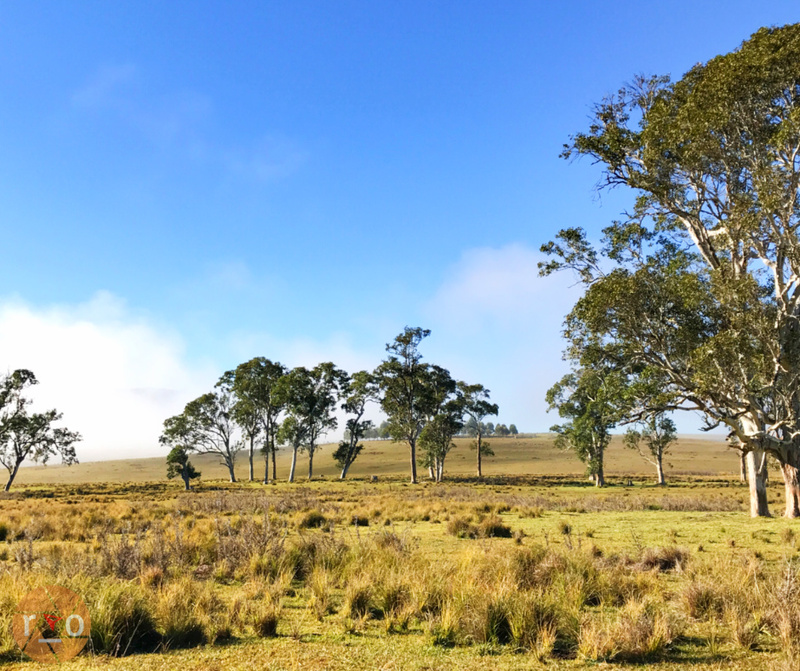 I chatted with our new neighbours – they had followed their navigation system along dirt tracks across the mountain range, unbeknown of the less interesting but quicker, sealed road to camp. I started preparing a simple dinner. Chicken and potato on the coals, with a salad. The starlight burned all worries away with its intensity; the wide open paddock gave us a brilliant view to an uninterrupted Milky Way. Digging out the Lumix GX7, feeling infinitely limited with the 12mm lens, but nonetheless engrossed in working with such a crisp clear sky. 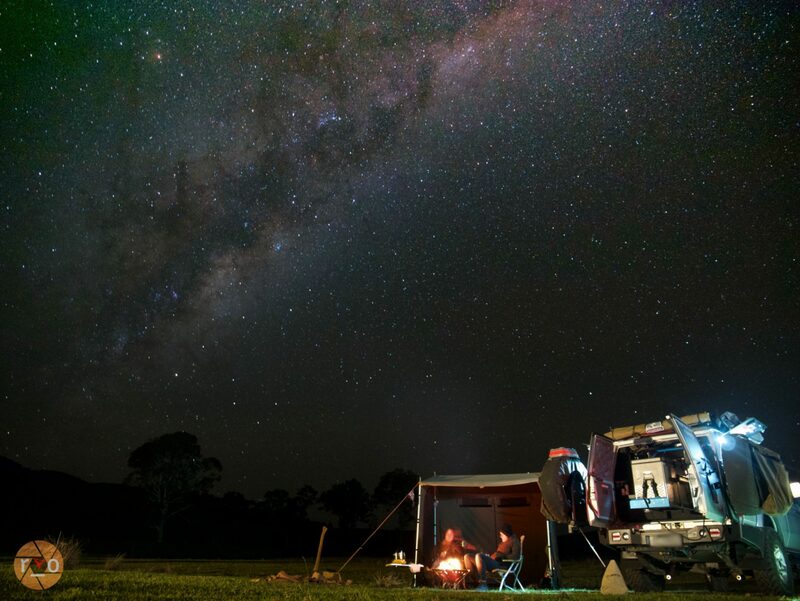 I chattered with another neighbour who rightly confused me for a rogue possum in the dark, crawling about for a photo of camp under the stars. After a while, my battery light flashing and fingers cold, I re-joined David by the fire and cup of tea. Before long we were tearing ourselves away from the warmth in favour of bed. After a very uncomfortable night of cold, intermittent sleep, we were up seizing the day and all the warmth it would offer. 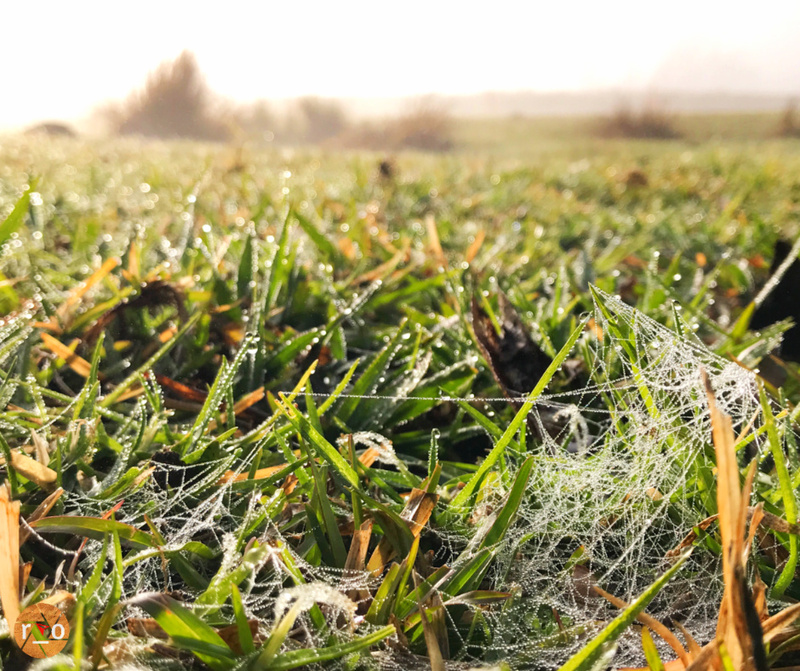 There was evidence of a frost thawing and the fog was picturesque. Friday being the first official day of the Event, vehicles started rolling in. No great stampede, but a steady procession. The day relaxing and exciting, all at once. As the light began to drop, a few more would arrive to begin filling out the paddock. Including the talented Nathan Beardman from PMCanvas, who recognised his handiwork on Cecil. Watching Ronny and Harry cook in the Snow Peak and Uniflame adorned Drifta kitchen was encouraging, and entertaining. 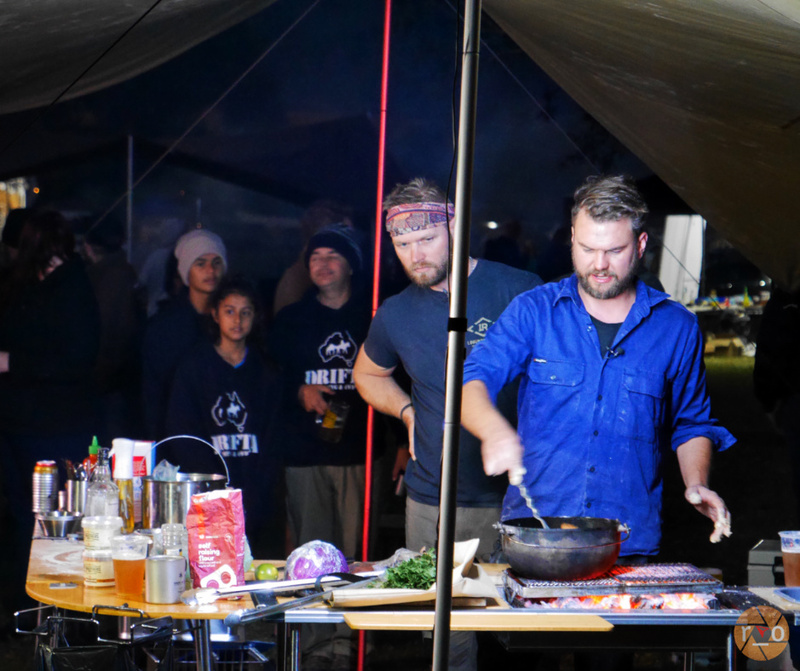 Creating and cooking real food on real fire (or coals) sans packaging. It looks as simple as it is delicious. Save the tinned soup for a rainy day, literally. I had a small piece of rolled pork loin, salted and roasting in our Snow Peak micro oval camp oven. Combined with salad, roasted potato and carrot, it disappeared shortly after carving. That out of the way, we enjoyed plenty of side-splitting laughs and eye-watering smoke from the trio of fire pits well into the night. The crew from 4Wheeling in WA, professional campfire comrades. Keeping the pits stoked to their temperature preference with a Ryobi blower. Crawling onto the uncomfortable air bed at 1am, this time – we added a wool blanket to combat the cold air that capillerised up into our bones the night before. Insulated airbeds are unequivocally superior. I knew it before of course, and would surely not forget my Thermarests again. Up at 7am-ish I joined James Mandy’s coffee masterclass at the HQ tarp. Cup in hand. Given the ghastly sleep quality of the air bed, I was ready for donations. My morning brew already downed. The WA bean was incredibly fruity, hot and caffeinated. Harry was reanimating the fire when I returned to camp, and we thawed out beneath the sun. The mild but warm sun would quickly dry out the Oztent too. With the zubzero temperature and the privacy of the doors closed – we had considerable condensation raining down on us inside. It appeared to accumulate on the ceiling, collect at the seam above the window and drip in a neat waterfall. Maybe exacerbated given we slept with our heads at the back, closer to the canvas. The rest of the day was almost an europhic blur, I got to meet so many campers, tourers and 4WD enthusiasts, of all demographics. Friendly faces, new and known. Exchanging ideas on food; carrying, cooking, consuming. The LandCruiser; its travels, its modifications – performed or planned… all my favourite things. Camping draws on simplicity but its often more complex and varied as to how everyone writes their own formula. In the Drifta kitchen tonight, Ronny and Harry would prepare and cook deep fried and crumbed delights, sans icecream or chocolate, despite Ronny’s enthusiasm. Harry’s bucket flat bread (I can claim application of the olive oil, as Harry’s temporary kitchenhand) and the Auspit was called to action too. Behind them, the band, atop a Drifta lorry, performed sound checks. Watching their homebrew fuelled, kitchen comedy was making me hungry, so I returned to my own kitchen. 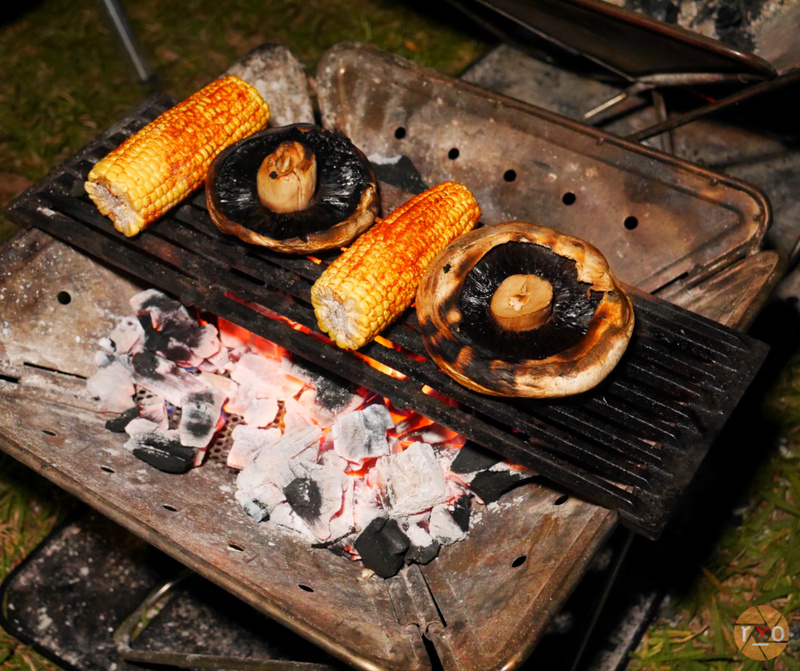 Mushrooms with paprika and cayenne corn cobs to start. 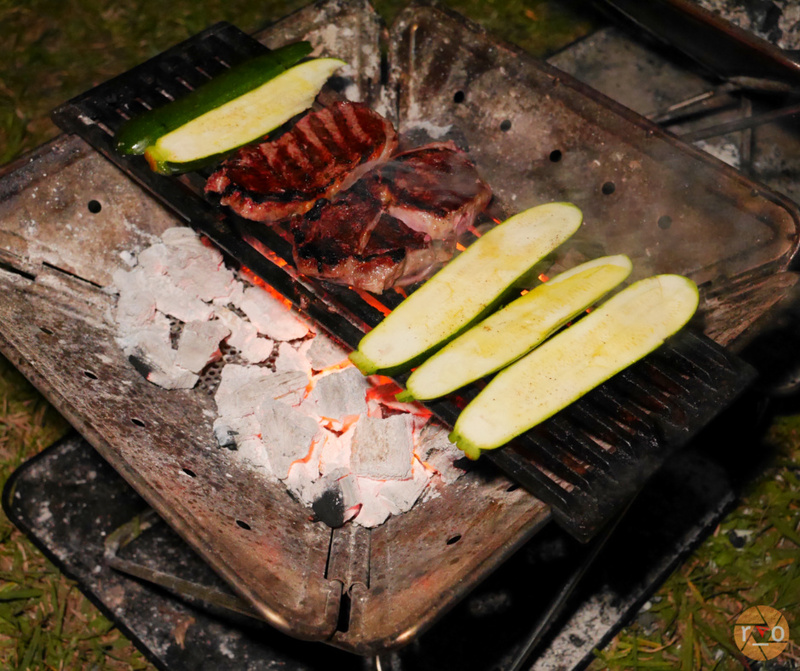 Followed by scotch fillets and zucchini. Stuffed, we stoked up the fire to digest, listening to the John Williamson covers. With the live music filling the valley, the campfire drawing everyone in close. Biltong and marshmallows were passed around. Sharing food and fire with those no longer considered strangers is a very relaxing feeling. Our varied banter continued, as only a campfire can induce, until 1am. Sunday morning began similarly to Saturday, frost, and misty across the paddock, some firepits spluttering into life again. We reluctantly commenced a very slow packing up of camp. Happily interrupted with anything and anyone who might delay the inevitable. After saying our goodbyes and voicing our gratitude to our hosts, we were rolling out of Cobark. Stopping in Gloucester for lunch before embracing the M1 southbound traffic jam. Forlorn that the weekend was over, yet riding on the high of what a success it was. Second time around, the budding community was confirmed. 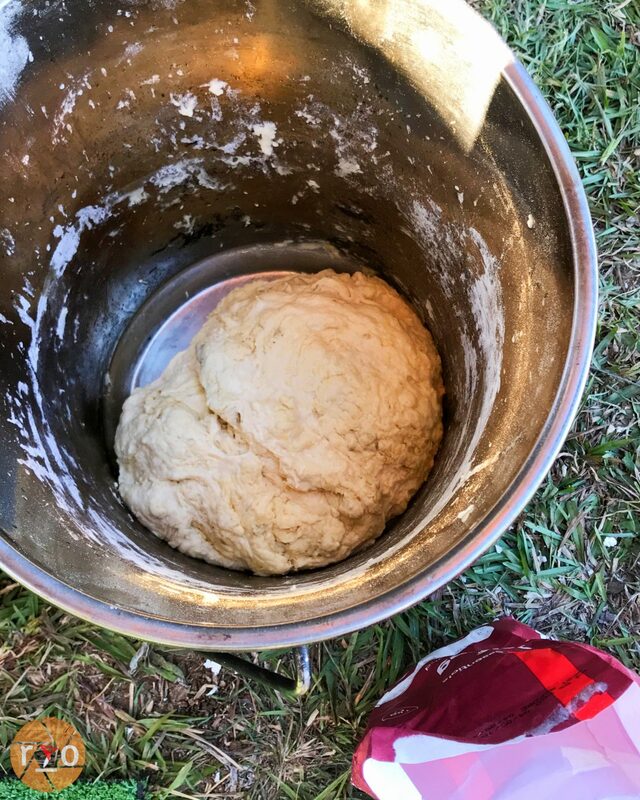 Materialising into a wholesome, camping etiquette that started with a few pieces of quality camping gear. After every camping escape, we learn a little more about ourselves and our setup. This was no different. I learned should finally replace the power hungry candles for interior lighting, with LED. After a few days and nights burning – they had upset the battery monitor. Also, that I can replace my butane flavoured aerosol Olive Oil. There’s a specific pump bottle I could fill with cold pressed, small batch, locally grown, hipster approved oil – myself. Thanks Harry. Oh, and never, ever, forget the Thermarests. 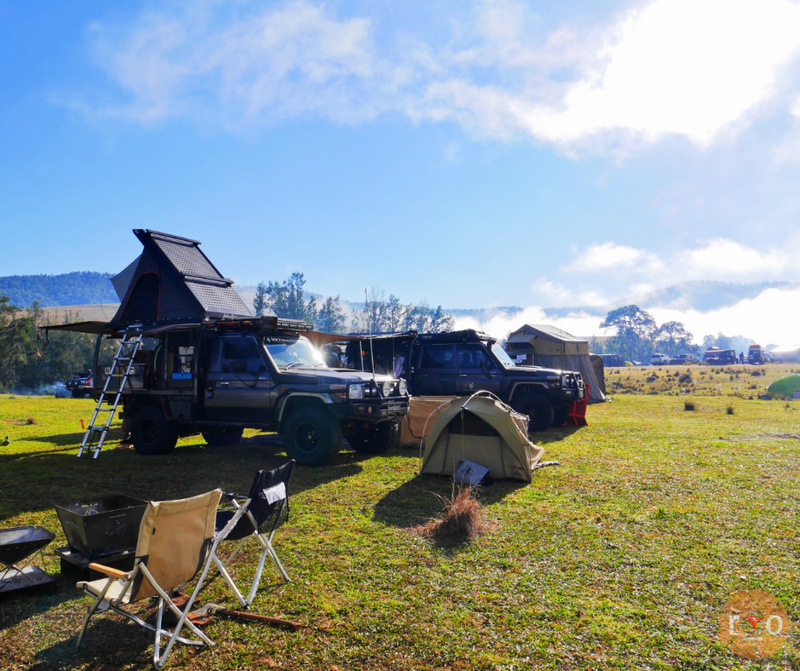 I can’t quite tell from your photos in this post… do you use the fly on your Oztent? Just curious as we’ve never had particularly bad condensation with the fly attached and set up properly. Well, not as bad as what you’re describing! But perhaps we haven’t camped anywhere quite that cold either… LOL! 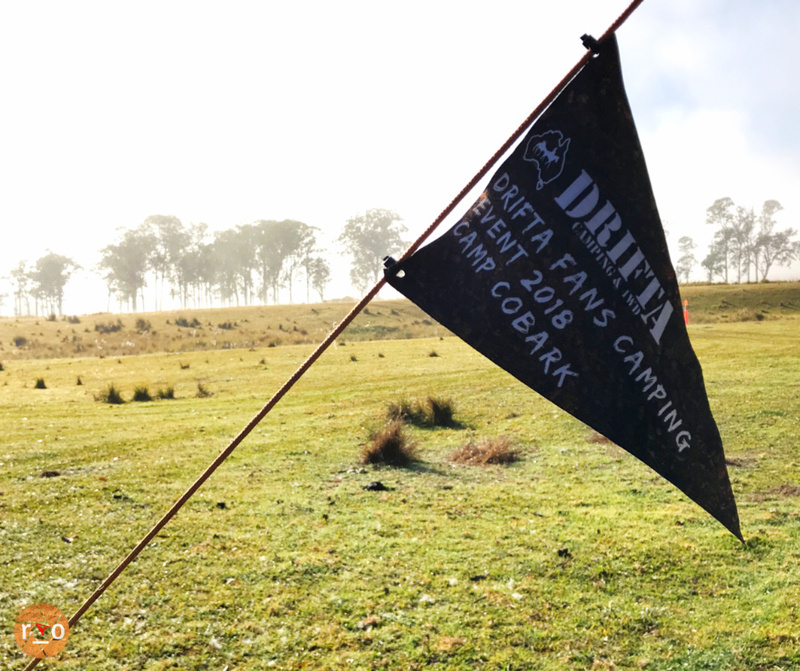 We’ve never run the fly for the Oztent and never had a real issue with condensation with the exception of a couple of sub zero camps. Perhaps a blessing – the mattress and condensation got me out of bed at a very grownup hour. I heard the QLD DFCE will be the first week of August, so – if aforementioned stars align…. we will gladly take you up on that offer. 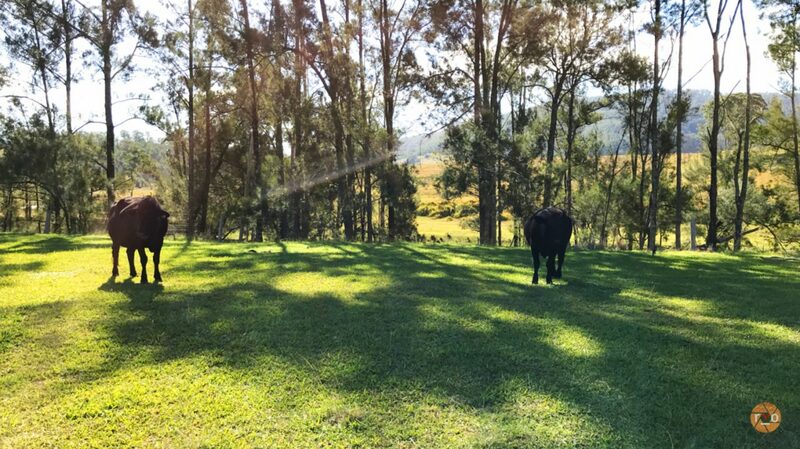 Else QLD is on ‘the list’ so we will likely crash your campsite at some point! Spot on! DFCE 2018 was such a great event. Everyone was really lovely and each set up was unique. 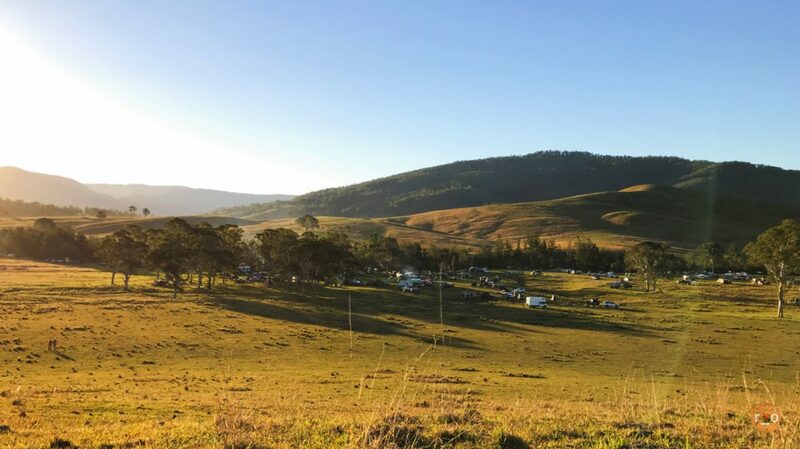 A sense of community and love for camping. Was nice meeting you and if you’re over in the West, make sure you say g’day. Great to meet you too! Hopefully share another campfire with you, in your Timezone soon.